It's the natural inconsistencies--the accidental differences between one finished piece and another--that make hand-printed fabrics, papers, furniture, and works of art so interesting. The quirks are what show the maker's intimate involvement in the process, and it's that unique quality that first attracted textile designer and illustrator Lena Corwin to hand-printing. 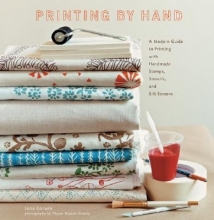 Even though decorative prints are more in vogue than ever, there was until now no up-to-date hand-printing guide--no single source explaining the tools and materials that are used today, or reflecting a contemporary aesthetic. Corwin has given us that guide. Using step-by-step instructions and up-close photos, Corwin teaches crafters everything they need to know to master stamping, stenciling, and screen printing, from making their own printing devices to trouble-shooting when plans go awry. Her inimitable collection of projects ranges from stamped stationery and simple-to-sew pouches, to stenciled tote bags and furniture, to screen-printed bed linens and upholstery fabric. There's even a silk-screened dog bed. The author has created original artwork for each project (full-size patterns are included in an envelope at the back of the book), so that every crafter can achieve the same beautiful results. Or maybe not quite the same. Remember: It's the subtle differences that make hand-printing so special and alluring.